By so long, we discussed the two objectives of the Ajanta composition; one, - easy composition by following the equal symmetrical concept, and secondly, the connecting-link composition where all the segments of a storytelling composition perform as a panoramic view. 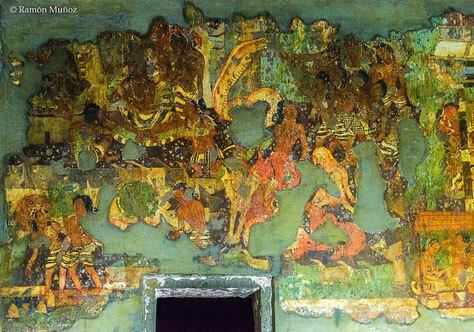 Besides this, there is another formation had been leading in Ajanta composition. We can recognize it as “Elliptical composition”. We can bring forth a great painting as an example that composed by the story of Sankhapala Jataka. In that painting, there are two sections; At the right side, Nagraj(the kink of the serpent) attacked Sankapala and has taken his custody. In the left side, Shrestha (a noble person who follow the rule of Buddha) relief Sankapala from fowlers and pioneered him in Buddhism. Each group composed elliptically around the center point of the composition. In the scene of the left side, all hands of those fowlers indicate their prey by producing a bunch of diagonal lines and the sprained figure of Nagraj, goes ahead to those hands of fowlers. By placing a figure below the group, the artist wanted to show circuitously that vertical golden point where fowlers arrested Nagraj. In the scene of the left side, there are two reverend figures; one of them (the main figure who is a mendicant) placed vertically slightly upside than the next. It’s an instance of the Indian traditional sense of vertical perspective that means Nagraj belongs far away than the mendicant. Both figures move towards each other tardily and it creates discrimination with the composition of the right side, which bears the fastest movements. By creating such contrasting composition, artists have proven their unique talent; it helps to lay out the importance of the initiation or inauguration of a spiritual life as well as it creates a divinity in the soul of the viewers, which was the main objective of the artist. A woman placed in the footer of those noble figures to indicate the center point of the composition. Ajanta cave painting from Jataka. The pre-birth story of Lord Buddha. Resourse - Wikimedia.org. There are a lot of such outstanding compositions we will find around the Ajanta cave proves the innovative mind of Ajanta artists. We have another example of duet-composition in number one cave where the subject based on group dance. In a palace, a prince is dancing before the princess with his royal member’s group. Another group of dancers and musicians are advocating the prince. Two groups composed elliptically around their center point and concurrently, the movement of the figures of each group produce irresistibly the center of their own group. By following the movements, the vision of the viewers will circulate automatically towards the center point of any group. One of the figures will help us to move from one group to another who stands in the middle portion of two pillars of the castle. Although it’s the figure of the group of the prince, however, explicitly, her figure moves towards the group of musicians. Alternatively, of those hints stated above, there is another matter related to the composition that produced a diagonal line to establish the connection between two groups. It is the amused structure of one of the female dancing figures that formed two imaginative diagonal lines ended through the sharp line of flutes of the musicians. To show the composition only with the lines, we have to create an egg-shaped drawing which has two ovals in the two corners of the egg. Just think about it! What a unique idea of connecting-link composition. Such composition will always pull you to the center of the composition as well as it helps you to go to the right direction; moreover, without foreshadowing, you will suddenly discover yourself as a part of the story, not just an audience. It is the magic of the Indian notion of perspective. 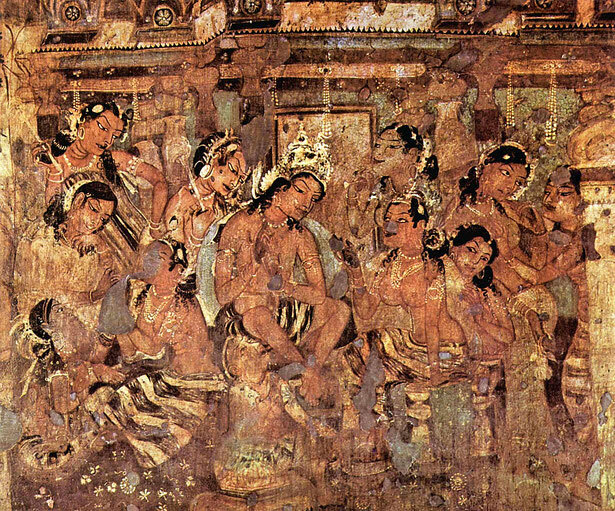 In most of the composition of Ajanta painting, you will find such concept predominately that based on any principal figure. The composition and perspective of Ajanta cave painting.